I became acquainted with the world of serious cycling in the early 80s, and began racing in 1985. That same year, I also began to follow the professional road racing scene, and learned of a young American phenom named Greg LeMond. Also that year, the Tour de France was carried on national television, with each week’s action broadcast during the weekend. So it was that I followed the 1985 Tour de France and watched LeMond, a member of the powerful La Vie Claire team, surrender (albeit somewhat begrudgingly) his chance, or rather his nearly certain opportunity, for victory in the Tour in order to support teammate Bernard Hinault win his record-tying fifth Tour title. Being American, I personally wished LeMond had grabbed his opportunity, but was gratified when a thankful Hinault publicly announced he would be helping LeMond in 1986 secure his first overall Tour win. It was that pronouncement that set the stage for what Richard Moore claims in the subtitle to his new book, Slaying the Badger, to be the “Greatest Tour de France”. While this assessment, as Moore acknowledges, is subjective and questionable, there is no doubt that those of us who followed the 1986 Tour were spellbound as we watched the intense intra-team intrigue resulting from Hinault’s apparent, and generally acknowledged by all but Hinault, betrayal of his promise to LeMond. Slaying the Badger reads like a well-written novel that I could hardly put down, even though I already knew the ending. What I didn’t know was all the background detail, the subplots and the personalities involved in this story. And even though I felt I had a decent feel for the personas of LeMond and Hinault, the full story told by Moore gave me many insights and a much greater understanding of these two extraordinary antagonists. Moore’s genius in this book is two-fold: First, it is in delving into LeMond’s and Hinault’s beginnings and development, both in their lives and their racing, leading up to their epic battle in 1986 and the interplay of their personalities and characteristics. Second, it is in bringing in the surrounding personalities. In addition to Hinault and LeMond, Moore interviewed approximately 20 people involved in this Tour, including La Vie Claire’s directeur sportif, Paul Köchli, Hinault and LeMond’s prior directeur sportif, Cyrille Guimard, teammates Andy Hampsten, Steve Bauer and Jean François Bernard, opponent and title contender Urs Zimmerman, 7-Eleven soigneur Shelley Verses and assistant directeur sportif at La Vie Claire, Maurice LeGuilloux, all very familiar names to those of us who followed this drama. Moore’s interviews with Hinault and LeMond are fantastic reading. Hardly less compelling are those with Köchli, Guimard and Hampston. While Moore draws certain ideas and conclusions from these interviews, he relates them in such a way as to allow you as a reader to also develop ideas and conclusions of your own. The book is organized like a stage race with a Prologue, Grand Départ and Arrivée. In the Prologue, Moore relates his interviews, and their settings, with LeMond and Hinault. The Grand Départ, details the histories of LeMond and Hinault which deliver them to the 1986 start line. Arrivée tells the story of the 1986 Tour. Slaying the Badger is masterfully written, pulling in tidbits from interviews, articles, and several other sources and deftly tying them together as the story unfolds. Moore succeeds in bringing all his characters to life, not an easy thing to do, even in non-fiction. His descriptions and attention to nuances add depth and character to this tale. After reading this book, even though I was all for LeMond and am glad he won this Tour, I could not help but admire Hinault’s competitiveness, aggression and panache. He was a true “patron” of the peloton, a strong and compelling leader. Conversely, I liked LeMond’s open personality and, if you will, his “American” nature. But I cannot help but feel that in the final analysis, Hinault was the more calculating and intelligent racer, with an ability to take the pulse of a race and the competition, while LeMond simply was blessed with tremendous strength. I don’t think, after reading this book, that LeMond could have been the patron of the peloton like Hinault. Unfortunately, as a result of LeMond’s near-death gunshot wound in 1987, a severe interruption in the prime of his career, he did not have the opportunity to move into that role. This would have been the prime opportunity to do so, given Hinault’s retirement at the end of 1986. But even given his comeback and subsequent Tour victories in 1989 and 1990, he never showed the same ability to lead and control the peloton. I loved this book. I was young (relatively, being only three years older than Hinault), new to the sport and excited about racing. How could my introduction to the Tour de France be any more exciting that the 1985 and 1986 editions? Plus, I lived in France for a couple of years. So how could I not love this book? Well, easy. If it was poorly written. But it was not. Rather, I think it is one of the masterpieces of cycling literature. The Tour begins this year on June 30th, the day this issue of cycling utah hits the newsstands. If you are like me, this means you spend your days avoiding Tour news, and your evenings staying up late watching Tour coverage. 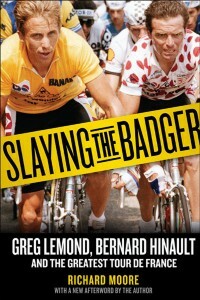 Slaying the Badger would be an excellent companion to watching the Tour. Alternatively, it would be a great way to get your Tour fix after the Tour itself is over. Indeed, Slaying the Badger will make for exciting and excellent reading, and rereading, whenever you choose to pick it up.